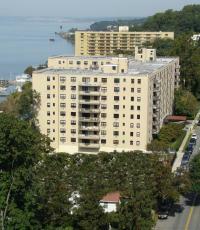 The Greystone, a luxury cooperative apartment, is conveniently located in southern Westchester County, right at the Metro North Greystone station. A private elevator to the station and a quick 30-minute express train ride to Grand Central make this building a commuter’s delight. Our spacious apartments feature stunning views of the Hudson River, the Palisades, and the rolling Westchester County hills. Amenities include 24-hour doorman security, an attached garage, an outdoor pool, and a newly renovated gym. The 204 apartments range in size from studios to three-bedroom/two-bath units with expansive terraces. Larger units have as many as 10 closets. Laundry rooms at both ends of the building are equipped with the latest high efficiency washers and dryers. Our building is primarily owner occupied and governed by a shareholder Board of Directors. Hudson North Management, LLC keeps our prestigious building in top shape. Residents: Log in for News: neighborhood & building related issues... Catch up with The Greystone Connection Newsletter.